Sign this pledge to demand support for mandatory GMO labeling and tell your Senators to the new bill introduced by Senator Pat Roberts. The U.S. needs a national labeling law for genetically modified foods. While it won’t undo years of damage from genetically modifies organisms, it will give us the right to know what’s in our food and give states the power to facilitate consumer choice. For years we have been kept in the dark about our food system and misled by bogus marketing claims from big food’s Grocery Manufacturing Association. And while the government’s role in regulating genetically modified foods has been kept aloof by “powerful industries with bottomless pockets,” human and environmental health has suffered. Now we are faced with a legislation developed by some food companies in response to states’ efforts to label GMOs. Dubbed Denying Americans the Right to Know or the DARK Act, this bill has passed through the House of Representatives and will soon be introduced in the Senate. Void state legislation requiring GMO food labels. End the FDA’s efforts to produce a national GMO labeling system. Allow GMO ingredients in so-called “natural” food products. 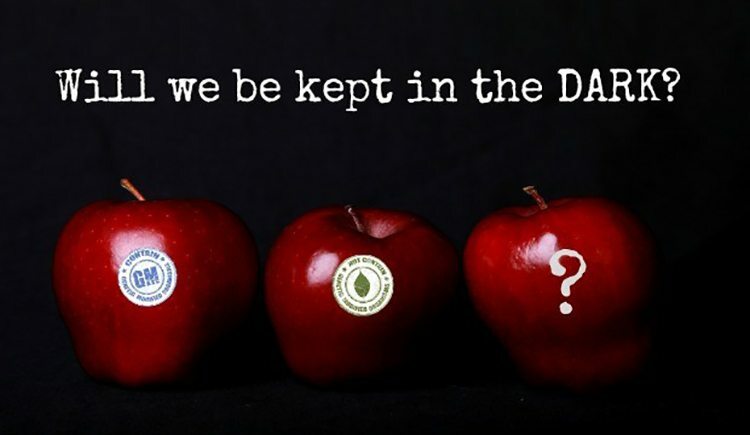 We need to take immediate action and urge Congress to oppose the DARK Act. Contact your Senators, Representatives and Congressmen and women and take back your right to know! Be part of the growing movement, backed by science and motivated by human and environmental health that’s up against “powerful industries with bottomless pockets” and stand with NoC as we continue the fight for federally mandated GMO labeling. Please sign the pledge to demand support for mandatory GMO labeling and find your Senator’s contact information to tell them to oppose the DARK Act. Victory! Thanks to your signatures, this pledge has made an impact!